“Danger! High Voltage” is powered by Big Time Gaming. According to the provider, it’s one of their most volatile titles. Here you should find huge winning potential in the free spins round if you manage to get to it of course. “Danger! High Voltage” is a six reels and four-row slot machine. This very highly volatile video slot has an RTP of 95.67%. The max win possible can go over 20,000x the stake. When it comes to pay-lines, the game has a staggering 4096 ways to win. All wins start from left to right on adjacent symbols. The min and max bets players can play range from 0.20 to 100, depending on the currency played. Danger! High Voltage has a very 70s psychedelic type of theme with disco lights covering the background. The high-value symbols on the reels, all relate to the theme. The highest paying symbol is a sugar skull with purple jewels on it. There is also a bell, a disco ball and a delicious looking taco following up as the higher paying symbols. 9 - A make up the low-value symbols. The scatter symbol features a red heart with a crown and the words “My Desire” merged on top of it. The slot has two wild symbols which only land on reels two to five. Both wilds appear stacked and cover the entire reel where they land. The wilds can substitute for all other symbols except the scatter. The potential for big wins truly comes into play during the special feature round in Danger! High Voltage. Here you have two free spins options, but we suggest that you go for the Gates of Hell option. Find out why in the reviewers’ thoughts section. The slot game has two wild symbols which only land on the three middle reels. Both wilds appear as stacked full reel wilds, meaning that they cover the entire reel where they land. There is the Wildfire and Wild Electricity. The wild electricity has a 6x multiplier on the bottom. Whenever this wild is part of a winning combo, that win will be subjected to the multiplier. 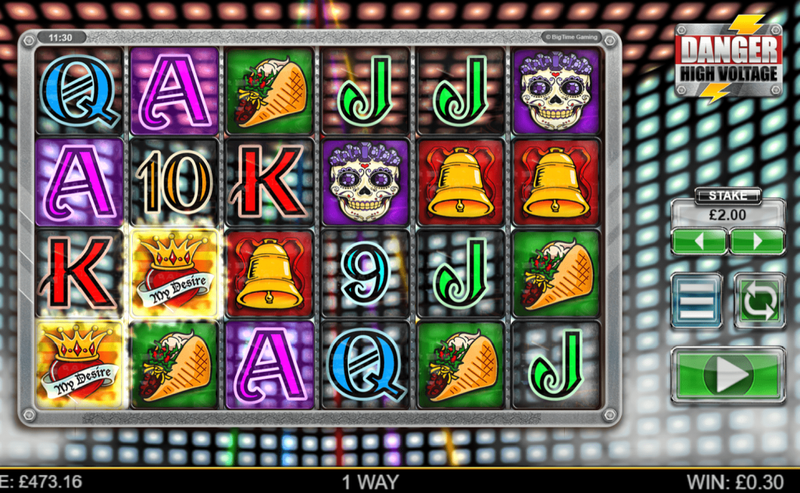 Players can trigger the free spins by landing three or more scatter symbols, anywhere in view, simultaneously. After triggering the feature, players can choose between two free spins options. The Gates of Hell option will award seven free spins. A random symbol will be selected as the Sticky wild for the duration of the feature. Whenever the selected symbols lands on the three middle reels, it will stick in place and work as a wild. Covering one of the middle reels entirely with sticky wilds will award three additional spins. The High Voltage option will award 15 free spins. During the spins, the “High Voltage Wild” can appear on reels two to five. This new wild is also a stacked wild which covers the entire reel where it lands. Multipliers cover the entire wild. The multipliers start from 11x and go up to 66x. When the High Voltage Wild lands on the reels – one of the multipliers on it will be highlighted. If the High Voltage Wild is part of a winning combo, that win will be subjected to the highlighted multiplier. Players can win three extra free spins if they land three scatters, simultaneously, during one of the free spins. You should always pick the Gates of Hell option and hope that the symbol that shows up is a lower paying one. Take a look at this video by Letsgiveitaspin to understand exactly why. Since this is one of the few extremely volatile games, we were quite excited to see what it had in store. We gave it around 30 minutes of spins and got nowhere near potential wins, let alone the bonus ourselves, so we had to resort to our own youtube videos to check out the special features.